First, the inquiry has engaged in salami-slicing, assessing cause and motive in individual moments without stepping back and examining the whole. 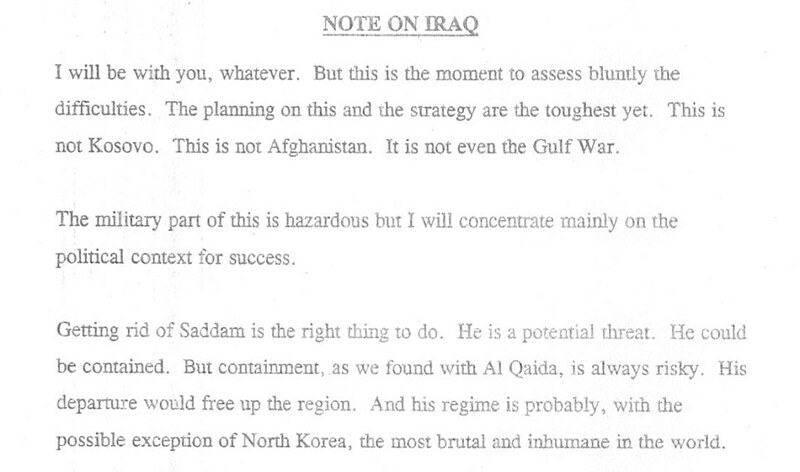 The whole makes clear that the decision to remove Saddam Hussein and wage war in Iraq was taken early, and that intelligence and law were then fixed to facilitate the desired outcome. A prosecution of Tony Blair for a ‘crime of aggression’ over the military invasion of Iraq in March 2003 has never been on the cards. A report is still awaited from the Prosecutor of the International Criminal Court on whether preliminary examination of new evidence (e.g. with the Chilcot Report) may result in Blair’s prosecution for complicity in crimes over the conduct of the war and occupation. The domestic common law crime of ‘misconduct in public office’ offers scope for prosecution. For this to proceed, an indictment must be prepared by the Crown Prosecution Service. A police investigation is first necessary to produce a file or charge sheet with evidence from which an indictment can be made. What might a charge sheet for this offence look like for Tony Blair. Areas of the decision process which initiated the military invasion for potential examples of ‘breaches of duty’, resulting in serious betrayal of public trust, from which the offence of misconduct may be applied. Twelve years after George W Bush initiated the illegal invasion of Iraq, ostensibly under the premise of pre-emptive self-defence, a stark majority — as many as 75% in 2014 — feel the so-called war was a mistake. As evidence rapidly accumulates that Bush’s yearning to launch an aggressive attack was likelier due to a personal grudge than anything else, that number will surely swell. Indeed the former president’s intelligence briefer lent yet more plausibility to that theory in an interview on MSNBC’s Hardball, making an admission that the Bush White House misrepresented intelligence reports to the public on key issues. “What they were saying about the link between Iraq and Al Qaeda publicly was not what the intelligence community” had found. “I think they were trying to make a stronger case for the war.” Which the administration had to do, considering no such case existed. When Blair first appeared before the Iraq inquiry five years ago, the chairman Sir John Chilcot treated him with almost painful deference. Chilcot, a crumpled figure whose opening remarks lasted seven minutes, never laid a glove on Blair, even though the former prime minister gave evidence for more than six hours. What few people know is that the bumbling Chilcot, a retired career civil servant, could, in fact, have greeted Blair as an old friend. The first time they met in 1997 — when Blair was still leader of the Opposition — was in a far more sedate environment. They dined together in the venerable Travellers Club in Pall Mall, where Chilcot is a member. The meeting was so discreet it would have remained a secret but for a single sentence in a 2008 book by Blair’s former Chief of Staff, Jonathan Powell, called Great Hatred, Little Room, Making Peace In Northern Ireland. At the time of the meeting, John Chilcot was the most senior civil servant at the Northern Ireland Office. He had agreed to the clandestine encounter with Blair almost five months before the Labour leader became prime minister. Civil servants often meet Opposition politicians for briefings in the run-up to elections, but they are usually held in Whitehall departments, where minutes are taken. Yet Chilcot had agreed to meet Blair in the club, which was founded in 1819 for ‘gentlemen who travelled abroad’, thereby ensuring it was not made public. After Blair became prime minister, he worked closely with Chilcot on the Northern Ireland peace process, until the mandarin took early retirement at the end of 1997. 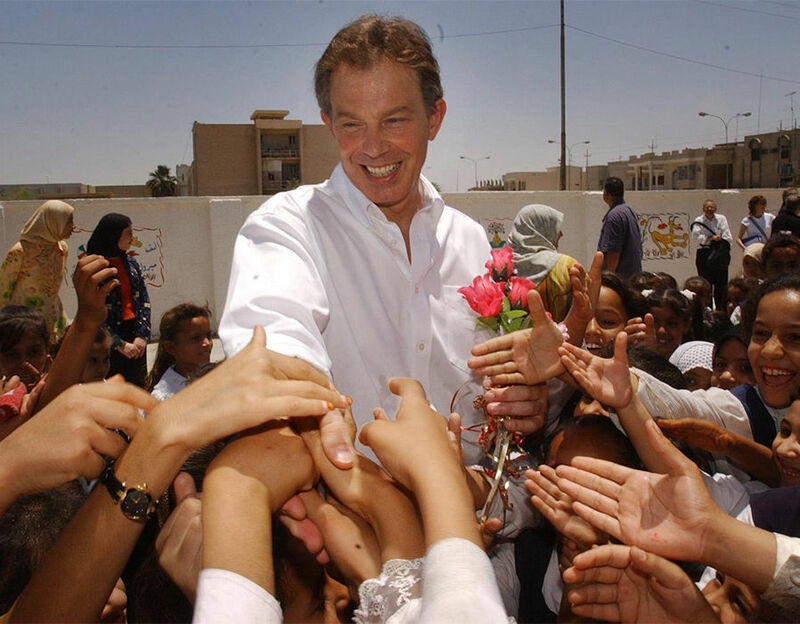 Chilcot was then knighted by a grateful Blair into the Order of the Bath, the fourth most senior order of British chivalry. But even after he retired from the Civil Service, Chilcot never really left the corridors of power — he has now worked in Whitehall for 50 years — taking on a series of roles on any number of public committees, often at the behest of the Blair administration. 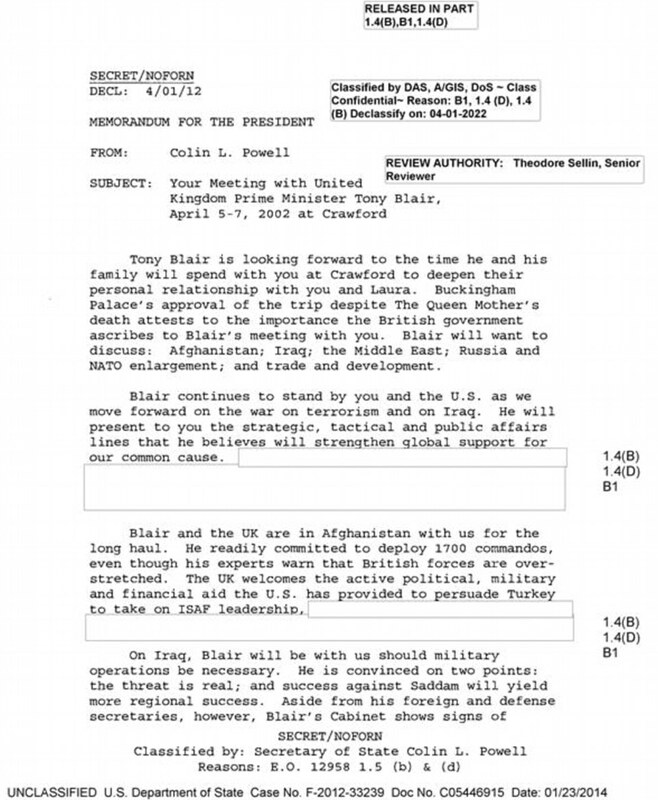 When Lord Butler was asked to set up an inquiry in 2004 into the role of the intelligence services in the Iraq war, Blair chose the members of the inquiry’s five-strong committee. Surprise, surprise, Chilcot was one of the first people asked to serve on it by the Labour prime minister. When it reported, the Butler inquiry was widely derided. Though it provided devastating evidence that Downing Street, with the collusion of intelligence chiefs, ‘sexed up’ the threat to the British people from Saddam Hussein before going to war, it concluded that no one should be held responsible. 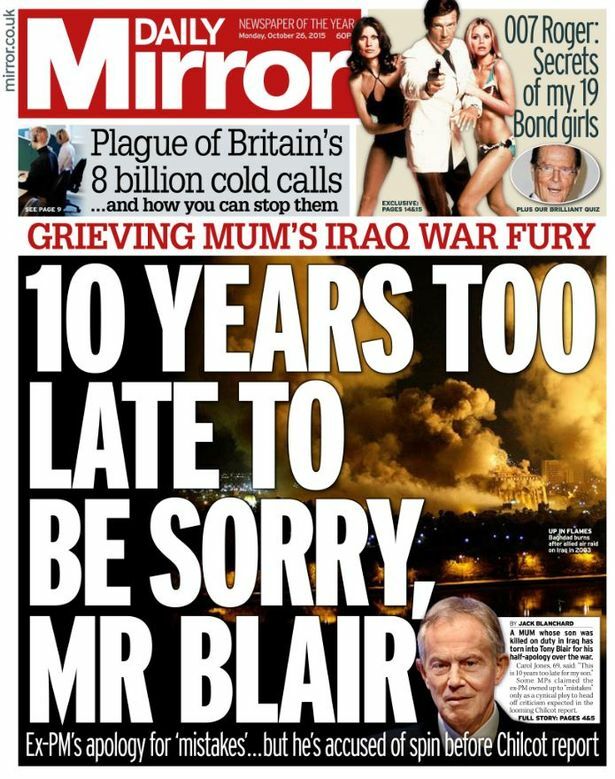 In short, it let Blair off the hook. In 2009, when Gordon Brown appointed Chilcot to lead his own wide-ranging inquiry into the war, military leaders as well as senior lawyers and politicians were furious that it was to be held behind closed doors. Major General Julian Thompson, who was highly decorated for his command of the Royal Marines in the Falklands, warned: ‘A report from a secret inquiry will look like a whitewash.’ The Tories forced — and lost — a Commons vote on who should make up the inquiry team, complaining they were ageing patsies who were not up to the job. Political pressure did, however, mean the inquiry was not held in secret. There was genuine scepticism that Chilcot, a former civil servant who had spent his entire working life immersed in the machinery of government, had the temperament to ask the forensic questions necessary to unravel an Establishment cover-up over the war. Philippe Sands, QC, who works at Matrix Chambers, the human rights firm set up by Cherie Blair, was one of the first to call into question the choice of Chilcot. Now professor of international law at University College, London, Mr Sands said: ‘It is not immediately apparent that he will have the backbone to take on former government ministers. ‘What was it about his role in the Butler inquiry that caused the prime minister to conclude he was suitable? Some who have worked closely with him, including on the Butler inquiry, fear he is not the right person. ‘Someone who has seen him first-hand described his approach as one of “obvious deference to governmental authority”. 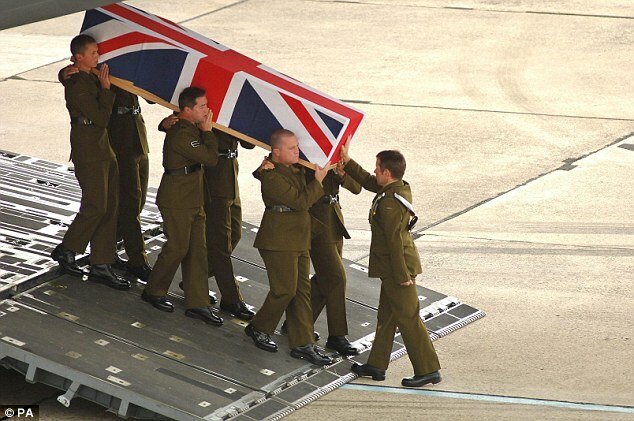 When it came to Chilcot’s own inquiry, held in a small cramped room in a grey conference centre in Westminster, there have been similar shortcomings — quite apart from the disgracefully protracted nature of the proceedings. According to former senior BBC journalist Rod Liddle, when former Washington ambassador Sir Christopher Meyer was before the panel he became utterly bored with ‘charming, learned and polite knighted people asking the gentlest of questions’. Then there was the moment in 2011 — two years after the inquiry had begun — when John Chilcot turned up in the audience at the premiere of a play about the build-up to the Iraq war. It was written by Sarah Helm, whose partner is Jonathan Powell, the most important official in the Downing Street ‘kitchen Cabinet’ during the war. In one scene, the actor playing Blair had a conversation with Sir Richard Dearlove, the then head of MI6, about intelligence issues relating to the war. Despite having interrogated Blair and Dearlove, Chilcot had never unearthed the existence of this particular conversation. After seeing the play, he demanded more files from Whitehall, which confirmed it really had taken place. In truth, the play seems to have shed more light on the reasons Britain went to war than Chilcot’s blustering. He is, it is fair to say, a rather dry old stick. Born in 1939, he was privately educated at £31,000-a-year Brighton College and then Pembroke College, Cambridge, where he studied English and modern and medieval languages. An avid reader, he claims to love learning new words and once said he would take The Oxford English Dictionary in 12 volumes as his reading matter to a desert island. He married his wife Rosemary, an artist, in 1964. They have no children. The couple used to live in a £1.3 million farm in Haslemere, Surrey, but now divide their time between a £500,000 property in Somerset and a two-bedroom flat in Westminster bought without a mortgage in 2012 as the Chilcot inquiry was beginning to drag on. After spells in a variety of posts in the Home Office and the Cabinet Office, he ended up at the Northern Ireland Office at the start of the peace process. Even though Tory Northern Ireland Secretary Peter Brooke had opened a confidential dialogue with the IRA and Sinn Fein, Chilcot, a key figure in the talks, authorised a statement describing allegations in the media of negotiations with the IRA as a ‘fantasy’. After he left Belfast, Chilcot moved seamlessly into a series of government-appointed posts, chairing inquiries into the voting system and royal security, as well as into an IRA raid. Last week, it was reported he has been known to spend only seven or eight hours a week in his Westminster office on the Iraq inquiry. If true, it’s little wonder. With the costs of the inquiry soaring to £10 million plus, and Chilcot and his three fellow panel members earning a reputed £1.5 million from it, this lifelong mandarin has acquired a new nickname among civil servants. 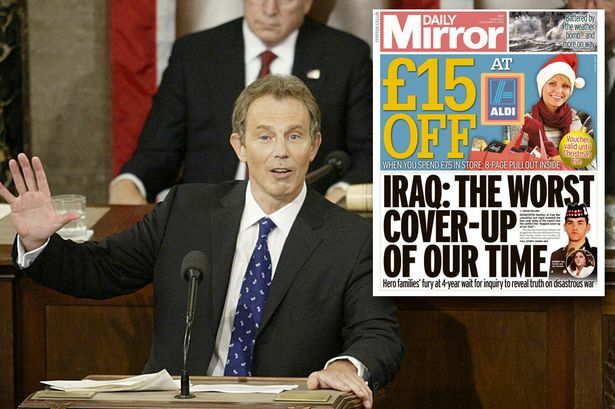 The codename for the initial British and American bombing raids on Iraq back in 2003 was ‘Shock And Awe’; they have dubbed Chilcot ‘block and bore’.